On the Google Drive tab, click Add Google. If you’ve got multiple Google accounts, select one on the next page and click Allow to grant Grepsr access to your folders. * If you’re prompted with a message saying “This app hasn’t been verified by Google yet. Only proceed if you know and trust the developer” after you select a Google account, click Advanced, and then Go to Grepsr. 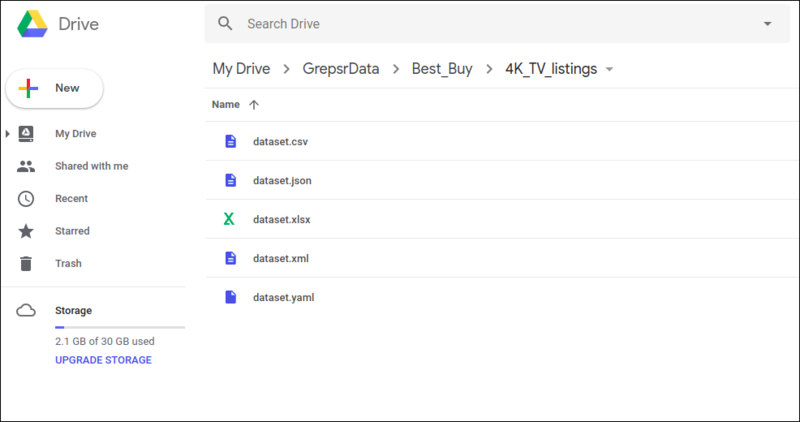 Once linked and your data exported, Grepsr will create a folder named “GrepsrData” in your Drive, within which are sub-folders named after your project and report (i.e. GrepsrData/Project_Name/Report_Name), and upload the data to this location.